This is a sponsored post on behalf of EarthKind. All thoughts are my own. Are you tired of searching for a safe method of pest control to use in and around your home? Most of us worry about pest control in the cooler and cold months during the year, but summertime and warm temperatures doesn't mean that your home will be free of tiny friends who are looking for food sources or new nooks and crannies to call home. Living in an old craftsman style house, built in the early 1900's, my home is no stranger to unexpected guests, all year long. Through the years, we've dealt with a stray mouse or two, oodles of spiders, ants in the kitchen, and even snakes in the cellar and yard. Yikes to those last ones! My husband and I were used to using a pest control service to come out to our home once a quarter and spray the perimeters of the house to keep pests out. In all honesty, I always felt bad about eliminating the pest problem in this manner. When we became parents, we became uneasy about not knowing exactly what was being used in and around our home to treat it for pest problems. Our children love to play on our wooden floors and crawl over thresholds and scoot along baseboards, which is primarily where pest control chemicals are sprayed in homes. Was it safe for our kids, for ourselves, for pets? 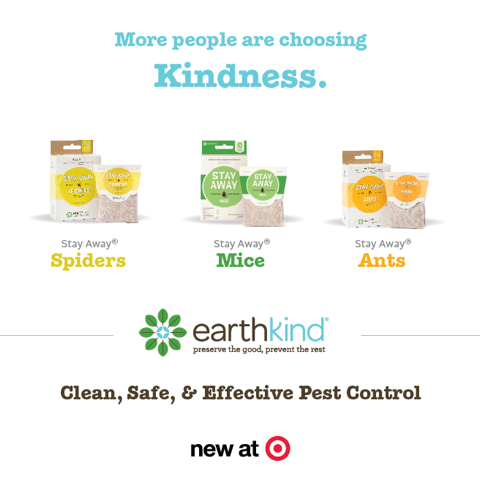 There's a better, safer, and kinder way to protect your home from unwanted pests, thanks to Stay Away by EarthKind. Say goodbye to cruel traps, chemicals, toxins, poisons and pesticides in your home. EarthKind’s Stay Away® fast-acting pest repellent products give you a kinder, yet powerfully effective option. Made exclusively with botanical fibers and oils sourced from American farms- and absolutely no poisons or toxic baits- Stay Away Mice®, Stay Away Ants® and Stay Away Spiders® is the high-performance, household-kind solution to easily rid your home of these unwanted critters. 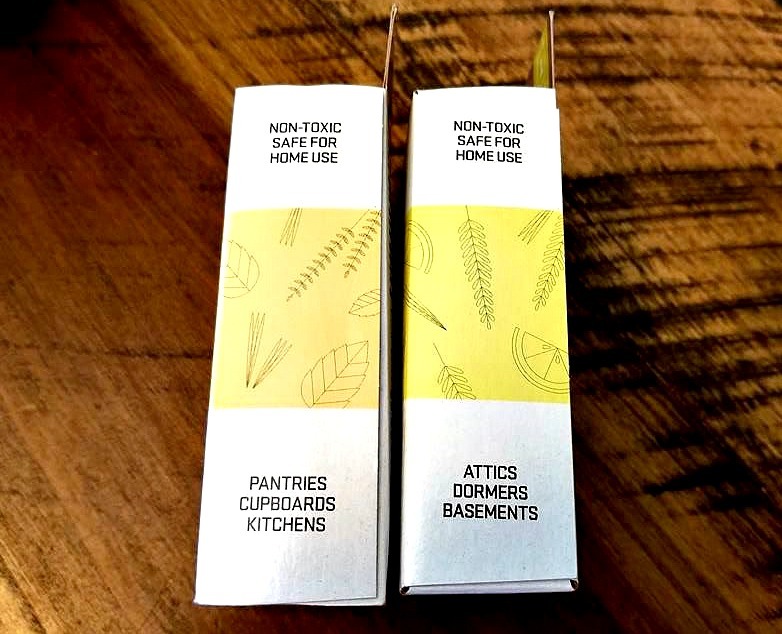 Stay away pouches smell amazing & offer a safe and effective way to keep pests out of your home! 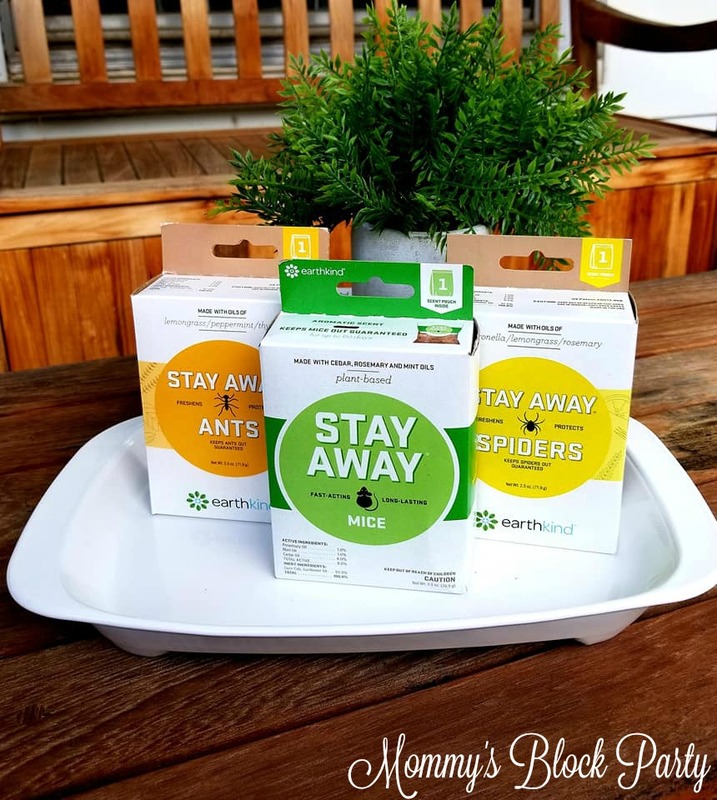 Stay Away is unique in that comes individually packaged, ready to solve your pest woes. Whether you're dealing with unwanted spiders, mice or spiders, Stay Away can help. Purchase the Stay Away product that corresponds with the pest who is taking up residence in your home. Remove from its packaging and read the instructions before using the product in your home. 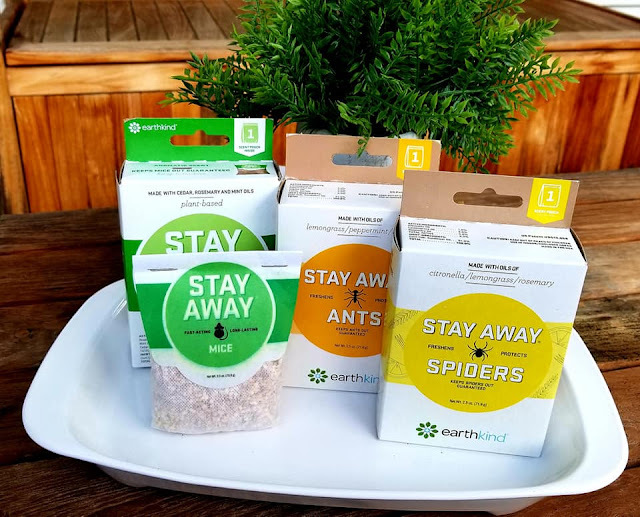 Honoring a live-and-let-live approach, EarthKind’s Stay Away® Ants, Spiders, and Mice pouches each emit a scent that is desirable for humans, but offensive to these critters’ highly-sensitive olfactory receptors- ensuring that they “stay away” from unwanted, pest-prone areas, such as kitchens, pantries, closets, and basements. I've already been using Stay Away products for a couple of weeks. 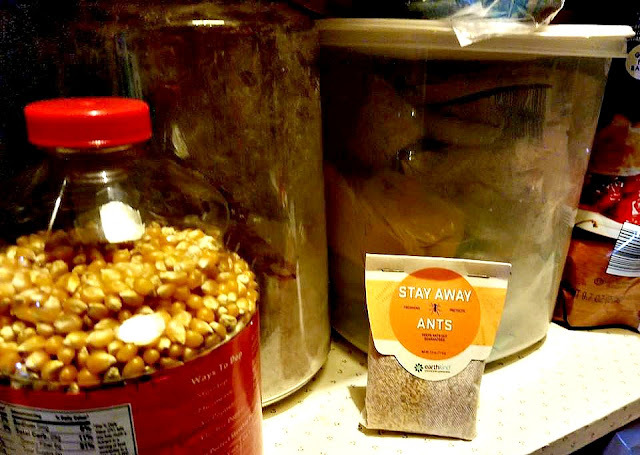 Due to all of the rain we've been having, we normally see an influx of ants getting into our pantry. Thanks to Stay Away Ants, we haven't had a single ant in the pantry since we placed the scent pouch in there. Not only is it keeping the ants out of our food, the pantry smells great! Stay Away Ants contains oils of lemongrass, peppermint, and thyme- some of my favorite scents! Don't forget to keep the scent pouches out of reach of kids and pets! Don't place the scent pouch directly on furniture- it may stain. Use the product indoors, near or in infested areas. You may increase the number of scent pouches used depending on the severity or how large the infested area is. Keep out of reach of kids and pets. Each scent pack lasts 30 - 60 days. Discard and replace when the scent has diminished. Have Questions? Look on the Box! The packaging and product insert contain important info about each product. Be sure to read the info on the box- directions for use are printed on the back. My closet usually sees a lot of spiders, so I've placed Stay Away Spiders in there, and have been pleased to see the spiders disappear. We haven't had a mouse in our house in a very long time, but one of our relatives has had a mouse issue in her kitchen for years! Stay Away Mice finally gives her a safe and effective product to use in the kitchen. We're pleased as punch with the results! The handy scent pouches smell great and they make pest control a breeze. Just place the pouch in your home, and see the difference it makes! When it no longer gives off a strong to moderate scent, simply toss it out and replace with a new pouch. What could be safer and easier? My family is so thankful to safe an alternative method of pest control that's safer and kinder to all involved! Stay Away is now available at a Target near you for $6.29 each! Learn more about these awesome products over on the Earthkind website. You can also purchase through the Earthkind website. Connect with Earthkind on Facebook, Twitter, Pinterest & Instagram. One lucky MBP reader will win a Stay Away Prize Pack valued at $25.00. Just use the handy RC entry form below to enter for your chance to win! Please read through the rules and disclosure below and kindly keep in mind Mommy's Block Party is not responsible for prize fulfillment or delivery. 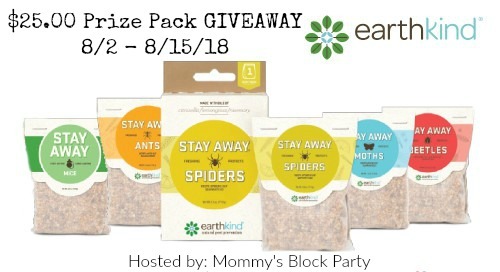 Special thanks to Earthkind for sponsoring this awesome giveaway for our readers! Look for them in our 2018 Summer Fun Guide! I'm most excited about the stay away ants product. We get any visitors in the beginning of each summer and I'm always looking for ways to get rid of them without chemicals. I want to try the Stay Away Spiders most of all! The spider one. Ugh, I hate them. I am terrified of spiders, so that would be the first one I want to try! Ant cups, Raid and other chemical products I have used in the past but they tend to give me a migraine and I don't like using them around pets or people. For the ants would be perfect in the house. Thanks so much. I once bought a whole bunch of Tupperware to keep those nasty little moths out of my food lol. I had purchased a bag of pet food at the market and before I knew it they found their way into my cupboards! I also have used mouse traps in the past, though I hate those things. I now have a cat, and the mice stay away! I would love the spiders one! We have them in every room in the house! I would try the ant version the most. Spiders, they seem to be everywhere! For ants, we use ant traps. For mice, we put sticky traps in the basement. OMG...I've been fighting ants all summer, so happy to see I can get this at Target! Woohoo! I love this product! I would love the Spider one. Ugh hate spiders. When we travel to Central America, my mother in law uses insect spray to clear our room of mosquitoes, it smells horrible but works. I want to try them all obviously but the spiders and the ants one would be perfect for where we live. There are spiders here and ants in the spring really bad every year and last until winter. I hate it.